Jean Pagliuso has photographed models, celebrities, movie posters and landscapes. In recent years, her camera lens has pointed in a different direction -- poultry. 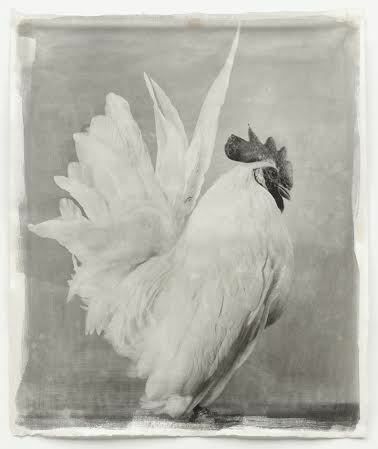 In her latest exhibition Poultry and Raptor Suites at the Mary Ryan Gallery based on her newest book Poultry Suite in conjunction with her ongoing Poultry Suite and Raptor Suite series, the photographer has proven that peacocks aren't the only fowl with something to flaunt. The works, featuring dignified depictions of over 20 kinds of chickens as well as falcons and owls, was not a completely new subject for the artist. Her father raised show birds in her home state of California and her familiarity with the subject and the ostensible respect given these feathered friends is apparent. A particular memory the artist has of her father has echoes of prepping models for a fashion spread. "If he was preparing the birds for the State Fair, he used to carefully wash each chicken in the kitchen sink. Then he would use a giant hair dryer or maybe it was just a big blower, to fluff up the feathers." Pagliuso adds, "This seemed absolutely normal to me. " The artist prints each photograph by hand in her studio, employing traditional darkroom techniques and applying the negatives on handmade rice paper and mulberry paper. The effect is lithographic and reminiscent of viewing something of historical significance and yet simultaneously timeless. Each bird is allowed its own portrait and to briefly insert fashion terminology here - they own it. The words poultry and poise are rarely if ever used in the same sentence but Pagliuso makes it possible, especially in the right lighting. The artist relays that the birds behaved best when photographed in the studio rather than outside. During their time in front of the lens, Pagliuso picked up on some traits birds evidently share with humans. " Like we are, some are smart, some are beautiful, some are rare breeds and some are a little slow...and beauty isn't everything."